Even for a franchise about time-traveling cyborgs, things in the Terminator movies have become pretty convoluted in recent years. But Arnold Schwarzenegger said the upcoming sixth installment will hit reset. Again produced by James Cameron, who directed the first two movies, and helmed by Deadpool director Tim Miller, Terminator 6 will bring back Schwarzenegger as the T-800 and Linda Hamilton as Sarah Connor. However, it will largely ignore much of what happened in 2003's Terminator 3: Rise of the Machines, 2009's Terminator Salvation, and 2015's Terminator Genisys. 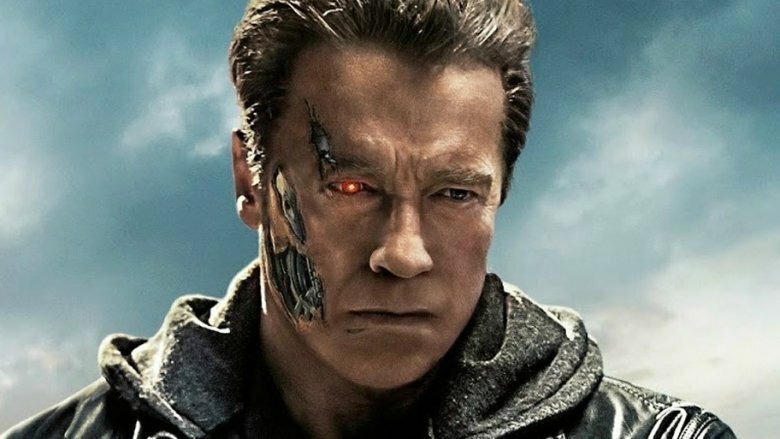 "I think [James] Cameron and Tim [Miller] came up with a concept where they can continue on with the T-800 but make a whole new movie," Schwarzenegger told Business Insider. "What they are doing now with this one is basically to just take a few very basic characters, like Linda Hamilton's character and my character, and dismiss everything else. Just move away from all these rules of the timeline and other characters." Schwarzenegger has appeared in all of the movies except Salvation, but we haven't seen Hamilton since 1991's Terminator 2: Judgment Day. Emilia Clarke (Game of Thrones) played Sarah Connor in Genisys, which takes place in an alternate reality. Cameron previously said that the three most recent sequels "didn't work" for various reasons, so he wants to "introduce new characters to 'pass the baton.'" So it's entirely possible that Terminator 6 could be the start of an entirely new storyline. Think of it as the Terminator version of Star Wars: The Force Awakens. Terminator 6 is slated to arrive July 26, 2019.